Today is the anniversary of the attack on Charlie Hebdo. While in Paris in April, I wandered around the offices of Charlie Hebdo and the HyperCacher where deadly attacks happened on January 7 and 9 last year. And today a young man was killed by police as he attempted to attack a police station in northern Paris. That he was armed with only a knife makes little difference. When we spent a month in Paris earlier last year, the police and military were professional, but most certainly on edge; we can only imagine what it must be like now. Today's attack happened in the 18ème arrondissement, which is where we stayed in Paris. The arrondissement includes a broad swath of people including a strong working class and a significant immigrant group, mainly from north Africa. 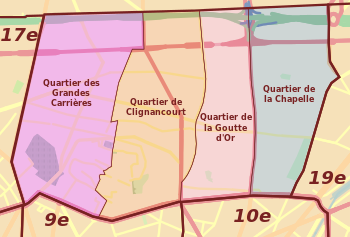 We lived on the western edge of the Quartier de Clignancourt. It is home to Montmartre and Sacré-Cœur. Less than 1000 metres to the east of our apartment is the Quartier de la Goutee d'Or, where this morning's attack occurred. The further north and east one goes in Paris, and its outer suburbs, the poorer its people. The further north and east one goes in Paris, the more likely it is to see homeless people and migrants. Some sell cheap trinkets at tourist sites, others camp out in donated tents under overhead metro tracks, while making their way to Calais. Or not. It doesn't always fit with our image of this amazingly beautiful city. What to do now? What does an important European state like France do? How does it reconcile its preferred bias for liberté, égalité et fraternité with an increasing national distrust of the other, even when the other is French? How does it balance its dedication to secularism in the face of increasing fundamentalism? An Aljazeera program sought answers to those questions and to that of the danger of increasing alienation of disenfranchised youth, usually in the northern and eastern suburbs of Paris. It's worth a look because of it challenges assumptions. About Paris and maybe about ourselves. Answers aren't always clear. We're all in this together. Aren't we?